Just wanted to try it. Verdict = yum. 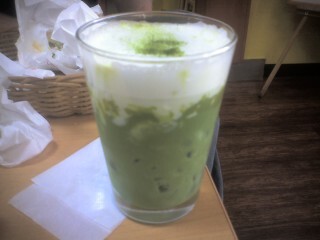 But I like macha. Edit - closing comments as I am worried about spam. Sorry if you are a legitimate commentor but this is a very old post and it seems to be getting new comments lately. It does just concern me. That drink looks enticing. Wonder how that compares with the green tea ice-cream I have in my fridge right now. Anyway, green tea ice-cream really tastes great. Problem is, I suspect it can add pounds too. Green tea ice cream is what we all crave…yummmmy. I honestly feel for one right now. I’m wishing i had that glass in front of me now. Wow, that looks good. I’m assuming the green tea latte pictured is hot. I’m thinking about making an iced tea concoction with some type of milk, ice, garnish, etc. If I come up with something good, I’ll post the recipe and a link to the picture. I may even try this with black tea (my fav. ).